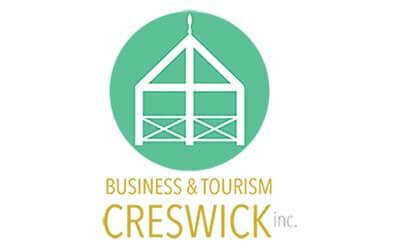 Business & Tourism | Business & Tourism Creswick Inc. This website is owned and managed by Business & Tourism Creswick Inc., a not-for-profit community group, and is provided for the benefit of our local community and visitors to Creswick. The group was formed in the early 1970s and with several name changes since that time, it has initiated a number of projects and worked towards the promotion of Creswick and district as an interesting, attractive and safe place in which to live. Business & Tourism Creswick Inc. is a representative body of community, cultural and commercial interests of Creswick and district. Its aims are to support the business community by promoting the town and district to attract visitors and encourage residents to “Buy Local”, provide a conduit for dissemination of information and to work with Local, State and Federal Government representatives to secure funds for community projects. The organisation undertakes various other activities locally for fundraising purposes for its various projects. Creswick has a long association with the arts, particularly through its former residents, the famous Lindsay family of artists and writers, and the Creswick of the Lindsays Arts Trail is an ongoing project. Current major projects include the Buried Rivers of Gold and the upgrade to the Magic Pudding Playground. We also organise the annual Creswick Garden Lovers Weekend each November. Membership is open to any district resident or local business owner. Meetings are held on the first Tuesday of every month at 5.00pm at the Farmers Arms Hotel. The Hepburn Shire Councillors for Creswick Ward and Hepburn Shire officers attend from time to time. Our current trifold brochure is available to download here. Should you wish to join us, please click here to download a membership form.